It's such a thrill to see the vast array of fabric dyeing techniques, some of them so intricate and time-honoured, filtering onto our high streets from every corner of the globe right now. 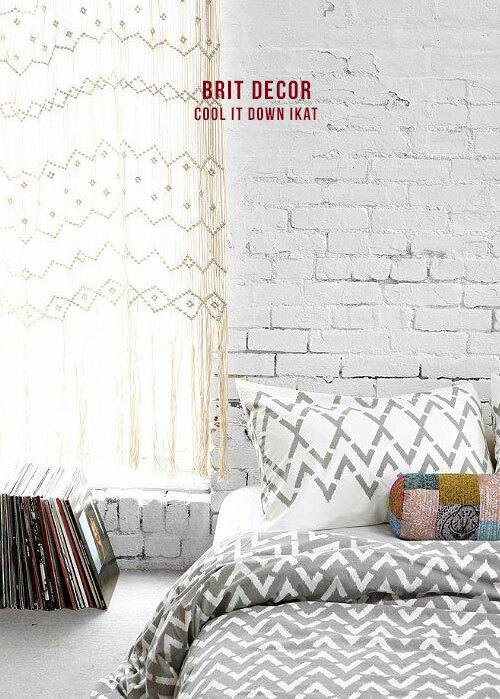 For me, one of these is currently standing head and shoulders above the rest, and yes you've guessed right, it's Ikat. In textile terms, this eye-catching graphic pattern is created through a resist-dyeing process, where certain fibres are tightly bundled together in a particular pattern and then dyed (there's even a 'double Ikat' technique for the highly skilled amongst us!). After the colour has been applied, the threads are unbound and woven into cloth to produce eye-catching products, which are undoubtedly worth an invite into our own homes. This year, more so than ever before, I have really begun to embrace pattern at the cottage, with deliberately eye-catching flash-points working in tandem with simple neutrals to create highly effective contrast and detail. However, one thing lacking in my home is some Ikat love! So here's an exploration of this graphic print trend and how we can make it work for us too. Standalone or as a lively partner, this pattern works well in many different situations. 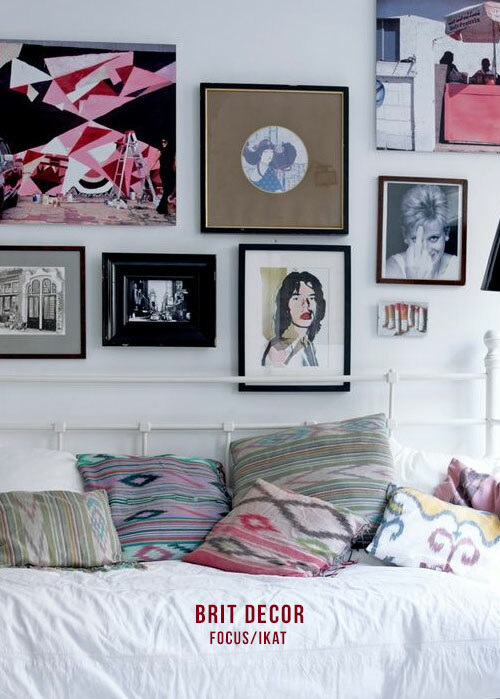 Work in some polka dots, stripes and florals to truly mix things up for a scheme that will shout 'PATTERN' to anyone within listening distance, like the bedroom setting in image no.4 above (from the top). Alternatively, we can opt for safety in numbers by grouping together a selection of Ikats to reinforce our commitment to the Ikat cause, as shown in image no. 1. A co-ordinating cactus is going to get my vote every time (image no.2)! 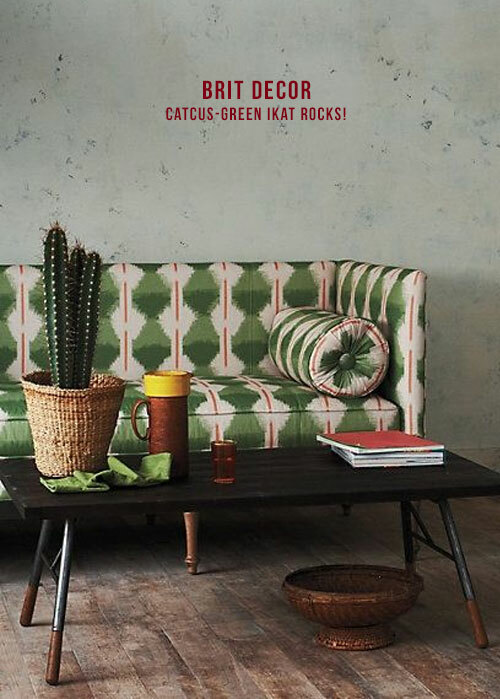 Plants not only breathe Co2 into our homely atmospheres, they also make great accessories and accent colours, as shown with this luscious Khaki-green patterned sofa. I felt like a spoiled child whilst I was searching online for some hot Ikat finds, and I could have easily overindulged on this look. There is no shortage of exciting designs out there, but 'below' I have chosen a few select accessories to hopefully inspire and get you in the mood to flirt with Ikat - if you haven't already. 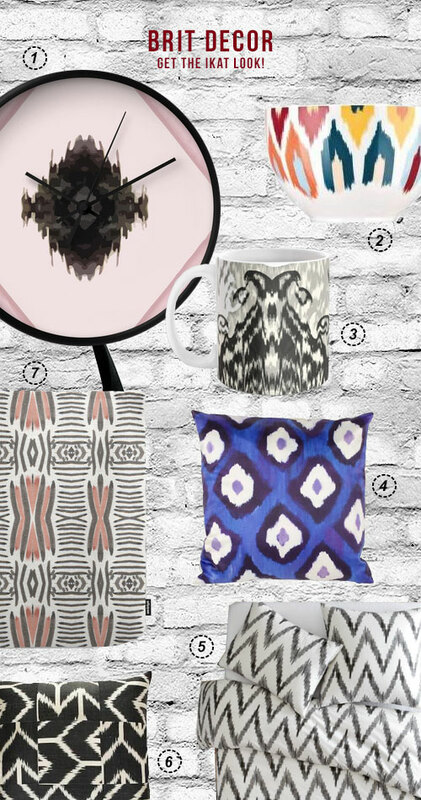 Check out my top Ikat shopping picks below - I think my absolute favourites have to be the Ikat Medallion mug from Society6 and the electric blue cushion by Mariska Meijers at Amara, but I could easily fid a place for every one of these in my home! 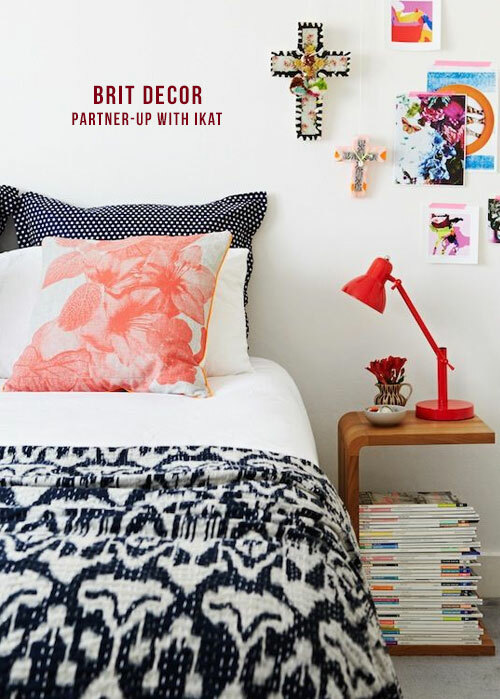 I'd love to know if you have Ikat in your home and if so, where and how have you used it?